There was once a barrier that separated our Arcadian, four-dimensional space from an uncanny cosmos where a $229,100 SUV makes irrefutable business sense. That wall is gone, and the Bentley Bentayga broke it. We’re accustomed to powerful SUVs. The Mercedes-Benz G65AMG makes the Earth weep on account of its 621 horsepower and 738 pound-feet of torque. 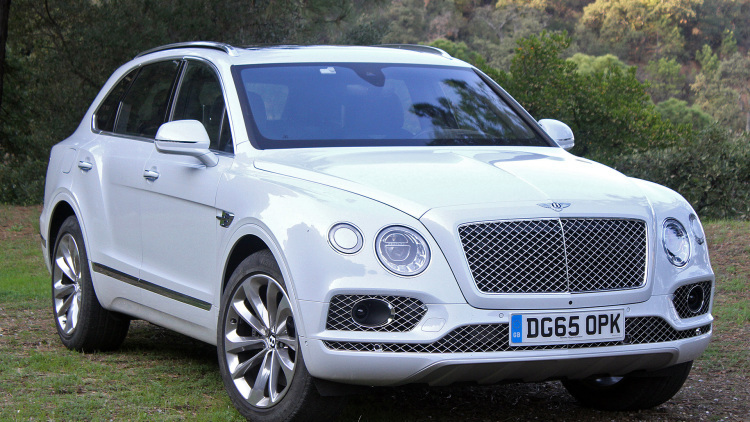 The Bentayga is shy of those figures, with 21 fewer horses and 74 fewer pound-feet. We’re also accustomed to quick SUVs; thePorsche Cayenne Turbo S hits 60 miles per hour in just 3.8 seconds. The Bentayga runs that race 0.2 seconds slower. And of course, we are accustomed to luxurious SUVs that fear no obstacle or load. The Range Rover Autobiography can swim its leathers and veneers through 35.4 inches of water, surmount nearly 12 inches when toiling off-road, and tow 7,716 pounds. The Bentayga can ‘only’ manage 19.6 inches of water, ‘only’ gets to 9.64 inches on its tippy toes, and is ‘only’ rated to tow 7,714 pounds. None of these facts are listed to harp on the Bentayga. It isn’t Bentley’s way to make rank by being the best in every category. Instead, the Crewe brand brings all the boys to the yard by merely being excellent across the board. TheContinental GT isn’t superlative at any one thing, but no other vehicle that can carry four people is as fast and as capable and as dynamic, and only Phantom-level Rolls-Royces can touch it for luxury. But here’s an important clarification: The Bentayga is not the Continental GT of SUVs, it is “the Bentley of SUVs.” The automaker describes the mission as, “driving, luxury, performance.” The interior advances the current design language with a two-piece instrument panel – an upper portion that slides through the center console in a “U” shape, and a lower portion that connects the console to the center tunnel. Bentley poses this as a riff on its flying wing badge, but it actually comes from interior designer Darren Day’s wish to fit an IP with a steeper rake. The size of an instrument panel is limited by the width of the door openings because the dashboard doesn’t go in until after the body is welded together. Day wanted passengers to be able to rest their legs on the buttresses tying the IP to the center tunnel, but his one-piece design was too large to fit through the doors. The two-piece result is sleeker and more artful than on any other Bentley, and more cohesive because it gives the console a cradle to reside in. It’s the centerpiece of the interior. The seat design is new, and they reverse Bentley’s former habit of using plain edges with quilted seating surfaces. The company says this new effect is more comfortable. We’ll take Bentley’s word for it – these cars are already supremely soothing. The steering wheel is new, with a tidy diameter and a not-too-thick rim. The infotainment system is new, with hard buttons flanking an eight-inch touchscreen with expanded options. The HVAC borrows from sister brand Audi, with LED readouts inside large knobs. That said, we wish Bentley had borrowed the glass buttons from the Mulsanne instead of settling for black plastic. The shifter is finally, 12 years after the Continental GT showed up, the modern, meaty grab handle the brand has needed, and not just something that feels plucked from a two-generations-ago Passat.